Unfortunately, research and statistics tend to back up these dire warnings. According to the Pew Charitable Trusts, a significant portion of Americans — 42 percent — lack access to an employer-sponsored retirement plan such as a 401(k), 403(b) or 457(b). Among those whose employers do offer a plan, only 49 percent actually participate. There is promising news about retirement, though, if you look for it. Americans — particularly Millennials (those born 1979 through 1996) — are starting to save for retirement much sooner than previous generations. According to the TransAmerica Center for Retirement Studies, Millennials begin to put away for retirement at a median age of 22. Generation X workers waited until 27, and Baby Boomers didn’t start until age 35. 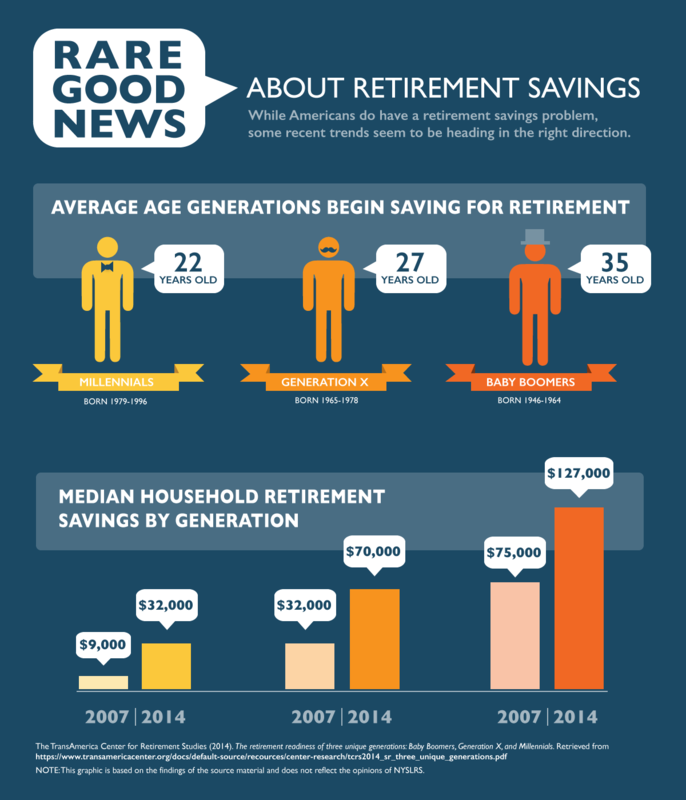 Perhaps this earlier focus on saving is responsible for other good news. For example, Fidelity Investments reports record 401(k) balances in 2016: $92,500 at the end of the fourth quarter, which is up $4,300 from 2015. And, earlier this year, the Employee Benefit Research Institute found that 55.4 percent of investors — more than ever before — are maxing out their individual retirement account (IRA) contributions. Americans do have a retirement problem. New York State Comptroller Thomas P. DiNapoli speaks regularly about the need for policies at the state and federal levels of government to ensure retirement security for everyone, including workers in the private sector. As individuals, the solution is simple: We need to save, and we need to start early. NYSLRS members have the rare advantage of a well-funded, defined-benefit pension. However, your pension and Social Security benefits are only part of a well-rounded financial plan. Consider contributing to a New York State Deferred Compensation Plan (NYSDCP) account. NYSDCP is a voluntary retirement savings plan — similar to private sector 401(k) or 403(b) plans — created for employees of New York State and other participating employers. If you work for a local government employer, please check with your human resources administrator to find out what savings plans are available to you. This entry was posted in General News, Retirees and tagged Comptroller Thomas P. DiNapoli, deferred compensation plan, ERS, Information is the Key, local government, members, millenials, New York, New York State & Local Retirement System, NYSLRS, NYSLRS Retirees, PFRS, public pension system, retirement, retirement plan, retirement planning, retirement readiness, Retirement Savings, retirement security, saving, state government, this public pension system works on July 19, 2017 by NYSLRS.